Yes, You Can Do Pull-Ups For Major Reps. Here's How! What if a single movement could rock your entire upper body, from the biceps to the back to the core? It can. It's your old enemy the pull-up, and it's time the two of you made peace. A perfectly executed pull-up looks crisp and smooth and has been known to induce excessive gawking from onlookers. Besides radiating to-the-bone badassery, this exercise is arguably the ultimate measure of upper body strength. Think about it: how many folks do you know who can bust out a set of 10 pull-ups with perfect form? What about weighted? People who can do them with perfection, you may have noticed, tend to be leaner and more muscular than the average gym-goer. This is no coincidence. I'm not just talking to the gentlemen. Ladies, I'm talking to you—yes, you. I know there are just as many women as there are men out there who are shaking their heads thinking, "but women can't do pull-ups." What a load of bull! Just like the belief that being out in the rain can give you a cold (you actually need to catch a virus) or that stress makes you sprout grey hairs (sorry, mom—that's all genetics), the idea that women aren't made to do pull-ups needs to be effectively trampled to death. You can do them, and what's more, you should do them. Now let's make it happen. A pull-up is more than just a great way to show off. It recruits every muscle in the upper body and is, surprisingly, one of the greatest activators of the core. Besides torching the lats (aka "wings"), the pull-up also hits the shoulders, arms, and traps. If you're looking to build strength and get the most bang for your buck for your time in the gym, ditch the bro curls—or at least save them for dessert—and make pull-ups the main course. Yes, it's true that women have poorer relative upper body strength as compared to men; it's the way our bodies are built. But if anything, this makes the pull-up even more important for women than it is for men. Remember: There's a difference between hard and impossible. It is quite the jump for a female to cross this chasm for the first time. But I can tell you that it's been done over and over, by myself and many other fit chicks out there. I've seen it all: legs flailing about, kipping (don't even get me started on those), and a half-range of motion or less. With any of these methods, you're either cheating or making the movement way more difficult than necessary. Look straight ahead. This will keep the chin tucked. The last thing you want is to strain your neck. Think of using your lats, not your biceps. All this will take is having a friend poke you in the lats a few times right before you begin the movement. Pull your shoulder blades back and down. Draw your chest up toward the bar. Clear your chin over the bar at the top and squeeze. Control the movement on the way down. At the bottom of the movement, stop just shy of lockout—keep a slight bend in your elbows. Not there yet? No problem. Luckily, there's a lot you can do to help yourself get closer to doing that mythical set of "8-10 pull-ups" you see in all those workout programs. Many people treat the lat pull-down or the assisted pull-up machine as an acceptable substitute for the pull-up, or a way to build up to pull-ups. I'm not one of them. While the lat pull-down has its time and place, it places the individual in a fixed position and doesn't use any of the core stabilizers. With the assisted pull-up machine, assistance is provided throughout the whole range of motion. In contrast, the methods I prefer only help at the bottom of the movement, the most difficult portion. Get your hands on a whole set of these if you can. The bands are color coded by thickness. The thicker the band, the more assistance you will get. Loop the band over a pull-up bar and get one knee—or a foot for even more assistance—into it. Now perform a pull-up as normal. You'll find that the band provides progressively less help as you pull your body up, and it's essentially all you by the time your chin clears the bar. The set is finished when you feel like you can bust out only 1 or 2 more reps without cheating. This exercise places the emphasis on the eccentric portion of the movement, which will help you improve the quality of your reps. Stand on a stool and get into position. You'll skip the concentric (i.e., going up) movement and simply jump up to get your chin over the bar. When you come down, you'll resist gravity as much as you can and make your way down slowly over a count of 10. If you do these properly, you'll hate yourself by the end. Perform anywhere between 6-to-10 in a set. For pulling exercises such as pull-ups, rows, and deadlifts, grip strength tends to be the limiting factor. 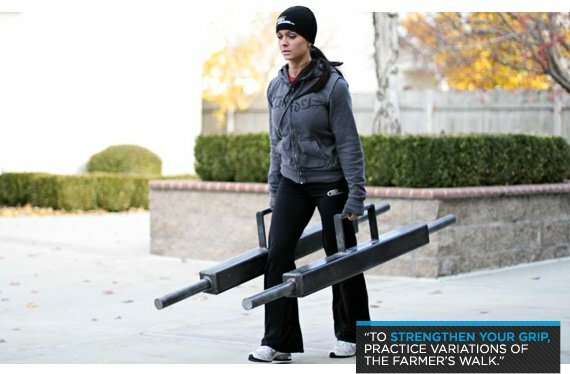 To strengthen your grip, try practicing variations of the farmer's walk. Grab a pair of heavy dumbbells and walk as far as you can. Fifty yards or so is a good length. Do multiple sets to wrap up your workout 2-3 times per week. The inverted or supine row has great carryover to the pull-up, as do other variations of the row. Dumbbell rows, barbell rows, Pendlay rows, Kroc rows—they can all help. Incorporate these into your training sessions. So how do you master your first pull-up? The short answer: practice, and practice often. Like just about every other skill in life, mastering the pull-up requires that you consistently execute the behaviors that will bring you closer to your goal. In the case of the pull-up, this means high volume and high frequency, but never to the point of failure. This means that if you're really on a mission to master your first pull-up, then you should sprinkle your sets throughout the day, nearly every day. You don't have to work in a gym where you have all-day access to a bar in order to pull this off, but you should consider buying—or building—an at-home pull-up bar to hang over your bathroom door or somewhere similar. Every time you pass the bar, or at least 4-6 times per day, do some jump negatives or band-assisted pull-ups. The key to greasing the groove is to never let yourself get to the point where you feel like you're grinding it out. If you look like you're having a seizure as you attempt to pull yourself up, it's time to call it quits. So when do you make the transition from resistance bands to strict bodyweight pull-ups? If you're using an inch-thick band and you can bust out 6-8 clean reps with ease, chances are you're ready for your first pull-up. Go on, give it a try. When you're feeling fresh, wrap your hands around the bar and get your chin over that damn thing. Feels good, doesn't it? Once you make it through this barrier, getting 3-5 reps is a breeze. Continue practicing the "grease the groove" method described above—but again, never go to failure. As long as you're consistent, you'll earn looks of respect from even the biggest meatheads in the gym. As you get better, you'll quickly realize that besides actively working on pull-ups themselves, dropping body fat will help you tremendously. Think about it: The leaner you are, the more lean mass you can utilize, and the less total bodyweight you have to pull. Of course, this feat will have to be accomplished largely in the kitchen—but that's a story for another time.